Carry a bit of cash and cards with panache. 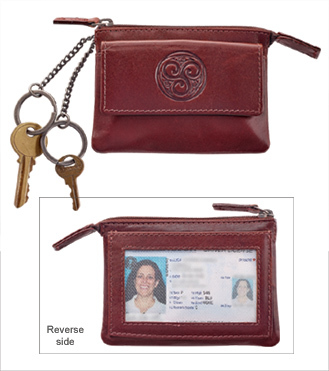 Handsome coin purse of vegetable-tanned leather is embossed with a triple spiral. Outer flap pocket snaps shut, main compartment zips. Back has a clear-window pocket for ID. Two key rings. 3" x 4". Handcrafted in Ireland. In Brown, as shown, or Black.